The namespace for all of the interfaces and objects associated with talking to Microsoft's Flight Simulator X. Thrown when FlightSimulatorX reports an exception. The event args for the EventObserved event. The event args for ObjectReceived. The structure that IFlightSimulatorX will fill in with information about the simulated aircraft currently flying in FSX. The structure that is passed to IFlightSimulatorX to control the location, altitude, attitude and details of the simulated aircraft. The interface for objects that can talk to Microsoft's Flight Simulator X for us. 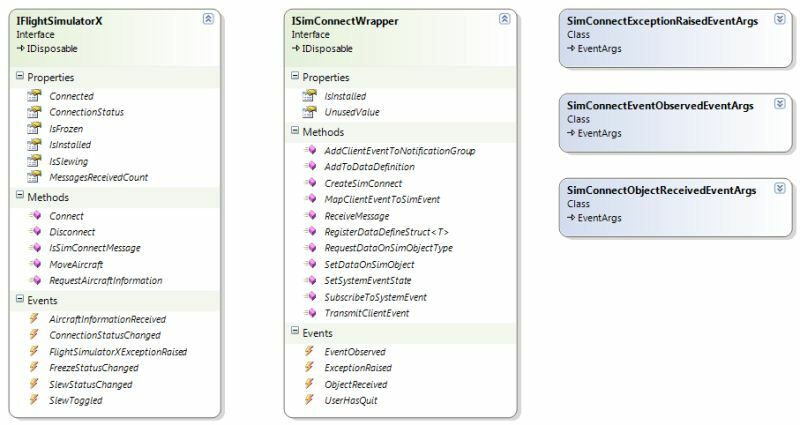 The interface for objects that allows tests to abstract away the SimConnect object that we have to use to connect to FSX. An enumeration of the values used to identify events within FSX that we are interested in. Many of these events are sent to FSX although some identify events which have taken place at the user's behest. An enumeration of the reasons given by Flight Simulator X for throwing an exception. The main class here is IFlightSimulatorX. ISimConnectWrapper is also of interest as implementations of IFlightSimulatorX may use it to talk to FSX. You will need to have read the SimConnect documentation before you can make use of ISimConnectWrapper. Only the parts of SimConnect that were of interest to the application were wrapped.